The "Squirrel Friends" are our to Friday night volleyball champions, defeating the "Gold Diggers" in the tile game 2-0. It was a total team effort, with everyone picking up at least one kill throughout the match. 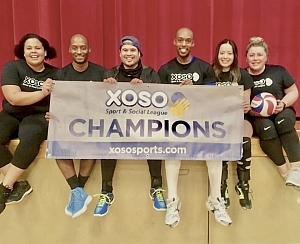 Overall our champs finish with a 7-2 record, including a league-high +12 set differential. That ends up being double the team in second place, "Team B", who finished +5. In total it was a complete season for "Squirrel Friends", a team that was always strongest just after a loss. Despite losing their first game of the our champs pulled together, winning their next 3 games. Midway through the season they'd lose to their championship game opponent, "Gold Diggers", before winning the next 3 once again to close out the regular season. They stayed hot for the championship game, eventually taking down the "Gold Diggers" in a thoroughly won match. Congratulations to the "Squirrel Friends" on the incredible season! We wish them the best of luck in the move to Thursdays!